118. A mode of doubling the length of stroke of a piston-rod, or the throw of a crank. A pinion revolving on a spindle attached to the connecting-rod or pitman is in gear with a fixed rack. Another rack carried by a guide-rod above, and in gear with the opposite side of the pinion, is free to traverse backward and forward. 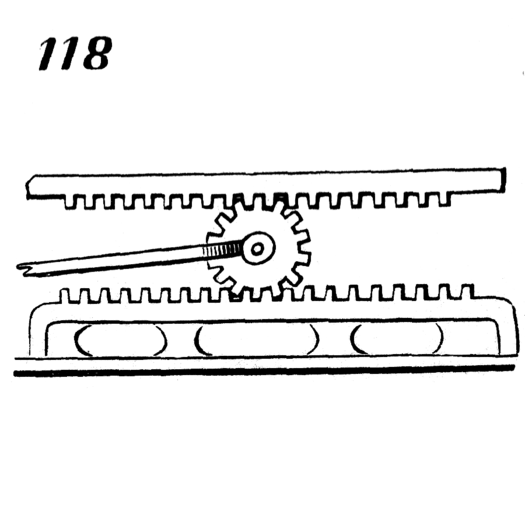 Now, as the connecting-rod communicates to the pinion the full length of stroke, it would cause the top rack to traverse the same distance, if the bottom rack was alike movable; but as the latter is fixed, the pinion is made to rotate, and consequently the top rack travels double the distance.